Elsewhere, the ESEA Rewrite being called the “Every Child Ready for College or Career Act of 2015” states explicitly that the advantages and disadvantages to be focused on are economic. In other words, factual differences in parenting like a family’s vocabulary, willingness to let a 2 year old play videogames in the grocery store cart, children’s travel opportunities, and other toddler experiences that affect whether a child is low-performing or high in traditional academics can no longer affect academic outcomes. It means that K-12 education in the US can no longer be about academics in the traditional sense or that purpose cannot be met. Not exactly a huge revelation to anyone who has read the details laid out in my book and the explanations why, but about to be enshrined in federal law. Seeing everything through results in terms of race, ethnicity, gender, and class used to be acknowledged as using a Marxian analysis. Now it is to guide the results of what can occur in K-12 education. I want to go back though to another Term of Art used in that purpose: quality education. That term has a very special defined meaning in the world of the UN System that we just keep running into that ties to its vision of a sustainable global Human Development society. How did an analysis grounded Karl Marx’s vision of categories that would guide consciousness to see the need for transformational change end up in that ESEA Rewrite Statement of Purpose? I think I’ll abbreviate it NCGA–No Child Gets Ahead. No matter how talented they are or how much care and time their parents offered them. So Quality Learning is experiential, social and emotional, relevant, constructivist, and is to fit the criteria of “Quality in the critical tradition” like Paulo Freire that “equates education that prompts social change,” encourages “critical analysis of social power,” and lets learners design their own experiences. Precisely what we keep noticing in the required implementation and had been hoping were out-of-line administrators just trying to get a promotion. Not enshrined into the federal definition of what K-12 must now become, like it or not, with virtually no recourse. Rather than dwell on quality education per the UN and its declared intentions, let’s pivot to the five witnesses scheduled to appear at the first committee hearing on the rewrite on Wednesday, January 21. Several are names we recognize. There is civil rights advocate Wade Henderson whose vivid statement became the title of this post. http://www.invisibleserfscollar.com/not-going-to-let-the-us-constitution-stop-us-from-using-schools-to-enshrine-global-social-justice-and-human-rights/ We also have Jia Lee, a teacher at the Earth School in NYC who shows up in links as wanting to Opt Out of standardized testing because it interferes with the progressive education vision. That would be the one created by John Dewey as my book also detailed extensively so let’s give Jia a check for on board with quality education in the UN vision. Next is the Denver School Super Tom Boasberg whose School Performance Framework is being touted http://spf.dpsk12.org/ as a model for other districts and states to use. Make that another check. Then there is Paul Leathers from New Hampshire that is piloting the Competency focus for high school that is also mentioned in the language of the rewrite. We met him here http://www.invisibleserfscollar.com/listening-in-on-the-confessional-drumbeat-of-the-common-cores-true-purpose-jettisoning-traditional-high-school/ Now, the last listed witness is a Marty West, listed as a professor at Harvard ed school. He also teaches though at the Harvard School of Government and was an advisor to Mitt Romney in 2012 and Lamar Alexander, the Republican committee Chairman, now. Those “non-cognitive skills” also go by the names of “social and emotional learning” or “21st century skills” says the paper. They are important traits “for success in school and in life.” They are “more amenable to direct intervention than cognitive ability, particularly beyond infancy and early childhood.” Sounds like quality education so far, doesn’t it? The paper’s intro that “disparities in so-called non-cognitive skills appear to contribute to the academic achievement gap separating wealthy from disadvantaged students.” Sounds just like that new purpose again. It’s not then just the use of the term “quality education” and its well-documented purpose that is the problem, but the declared interests of those first chosen to testify. But it’s actually worse than that. Remember when the federal DoED issued that awful “Grit Tenacity and Perseverance” report and critics were told it had no connection to the Common Core? The psychologist known for pushing the Grit and Perseverence sociocultural emphasis, Angela Duckworth, is a co-author of that cepr paper. When you follow a different co-author, Amy Finn, http://languagemagazine.com/?page_id=78313 on how to turn off “effortful learning” and the adult “prefrontal cortex using a technique called transcranial magnetic stimulation.” I have warned that there is a real interest in locking in psychological transformations at a physiological level. Following another co-author, Rebecca Martin, turned up that in 2008 SANS–the SocioAffective Neuroscience Society– Lab Network was set up globally to trade research. More checks for Quality Education globally then. Another author, John Gabrieli of MIT, turned up the McGovern Institute for Brain Research with a goal to “understand the organization of memory, thought, and emotions in the human brain. By combining brain imaging with behavioral tests, he studies the neural basis of these abilities in human subjects.” Gulp. Another co-author, Christopher Gabrieli is the Director of the National Center on Time and Learning, where 90s Outcomes-Based Education primary architect Marc Tucker is an advisor. It’s all back. It is the UN’s workforce and change the child’s values and personality vision and it is about to be quietly enshrined again into federal law like WIOA. But nobody is hitting their shoe against a UN lectern trying to get everyone’s attention on these intentions in time. Writing is the closest I can get in this Paul Revere effort of mine announcing that the transformation is planned, coming, and hiding in laws, charters, executive orders, and regulations no one is supposed to read.Well, I have and we all need to sound the alarm or we will be encased into a vassals and fiefdoms view of citizenship primed for a collectivist future. Quality education and the purposes of this NCLB rewrite and the entire actual Common Core implementation should be seen as government officials at all levels insisting that the lamb must come to lunch unarmed. Armed lambs will be checked via benchmarks and then forcibly disarmed. Just say no. To every politician you know and everyone they hire or appoint. Remember our motto–Not Serfs Yet. Welcome to 2015 everyone and buckle up. The year end solicitations and reports since my last post truly had the effect of tying up all loose ends and missing pieces in the jigsaw puzzle of what is truly going on around us. 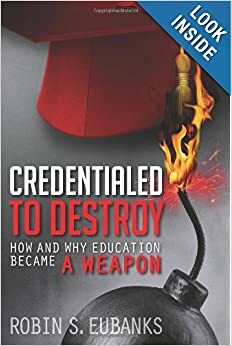 The intention is for this to be a seminal year in transformations in the US and globally and anyone who has read my book Credentialed to Destroy: How and Why Education Became a Weapon and reads this blog regularly will be in a position to immediately recognize what is happening to us. I honestly wish I was not correct about what is going on, but I am. Here we go again so we can all be ready to turn spotlights on what were intended to be stealth transformations at a local level that have been laid out clearly at the global level. The United Nations has an Institute for Training and Research–UNITAR–that has existed for about 50 years. Knowing, I suppose, that UN cronycrats are simply not people we are likely to willingly and knowingly take marching orders from, UNITAR has (per Chadwick Alger) a Decentralized Cooperation Program (DCP) that “trains local actors in order to enhance their capacity to implement international conventions and the MDGs.” Let me interrupt Alger here, MDGS stands for Millennium Development Goals and those UN intentions for all of us expire in 2015 so this is the year that the UN and its apparatus must come up with their post-2015 plans for all of us. Having 12 CIFALs–Centres International de Formation des Autorites et Leaders–Training Centers for Local Authorities/Actors–training mayors, school supers, influential legislators involved with economic development, city council members, etc. to implement the UN’s agenda quietly using their powers of coercion, regulation, taxation, and control over K-12 and higher education is certainly the mother of all confessions in my mind. Let’s see what Sally Fegan-Wyles said about CIFAL and its intentions to turn local actors into key change agents in its agenda in a 2014 brochure. http://www.unitar.org/dcp/sites/unitar.org.dcp/files/2014_cifal_brochure_compressed.pdf It fits in perfectly with what Alger said what UNITAR’s purpose in creating the stealth DCP program in the first place–“DCP is a hub for information, communication, and training between UN Agencies and local actors such as local authorities, public and private companies, civil society and academia.” That, of course, is the Turchenko vision from the USSR on how to quietly take over Western societies and economies for those of you who have read my book. It’s officially here, in operation, impacting all our lives, and basically invisible until this post. UNITAR and the DCP vision know now that “local governments have a crucial role in addressing global challenges. It is the local authorities who are the most closely in touch with the needs of their communities. On issues as diverse as urban planning, roads and public transport, energy, climate change, water and sanitation, disaster risk reduction, local leaders are increasingly leading the march towards lasting solutions. Local governments are also essential partners of the international community in implementing global agreements and advancing sustainable development.” Now, if we read the rest of that cited brochure, the fact that the Orwellian phrase “sustainable development” is actually a euphemism for Uncle Karl’s public-sector controlled, little c, Human Development Society, is quite obvious as meeting the ‘needs’ of everyone and ‘inclusion’ becomes the focus of society and the economy in the 21st century. We can see now why economic justice political theorists like Benjamin Barber have switched their approach to touting the gridlock in DC and wanting mayors and cities to be the new focus in government decision-making. It’s no wonder then that the Ed Leader 21 school districts have formed a Consortium to lobby Congress for a return to ‘local’ control of the school districts. http://www.invisibleserfscollar.com/deliberate-cultural-evolution-via-developmental-psychology-to-force-social-change-or-gypsy-supers-lobby-dc/ Remember our Curricular Redesign Global Change Agent Charles Fadel even coined the phrase ‘glocal’ to capture the real essence that what is being imposed locally and by what may technically be elected officials or appointees of elected politicians is actually global in the coordinated vision being put in place. That’s where I want to pivot to explain how the CIFAL Global Network came on my radar over the holidays and how it ties indisputably into absolutely every aspect of K-12 education from classroom and school instructional practices to who can get and now keep their teaching license. It is also tied to the WIOA implementation with each US state’s plan due by July as well as politically directed economic development UNITAR is describing and the workforce development new purpose of high school we have been talking about. When I first encountered the Atlanta Regional Commission’s plans for economic development in the 10 county metro area and its binding of all local school districts to ‘innovative learning’ using technology, I came across the name “Pendleton Group” as in charge of the vision. Lots of elected officials, school district employees, Chamber of Commerce reps, lawyers representing school districts and cities all involved with this vision. Two names of listed Pendleton partners stuck in my brain–Phil Jacobs and Craig Lesser. Phil Jacobs because he is now the Chair of the world’s largest education accreditor–AdvancED whose 2012 Quality Standards I described so alarmingly in my book. He is also on the Georgia Professional Standards Commission in charge of the new teacher licensing criteria. He also showed up as a listed name on a 2008 commission that in my opinion stripped Georgia elected school board members of their powers to object to what a district school super chooses to do concerning schools, curriculum, and instructional practices. When the various radical groups wanting me to give a year-end gift were bragging about their planned 2015 activities, I kept thinking about how much power WIOA had given them that would kick into gear this year. So I decided to look into whether the Pendleton Group had mentioned WIOA recently. No, but its head, Craig Lesser, had listed his leadership of something called CIFAL Atlanta that I had never heard of. Well, I have now and so have each of you. One of the 12 UNITAR centers in the Global Network and headquartered in Atlanta. No wonder I have been feeling accidentally immersed in all this collectivist nonsense with a deadly past. https://web.kennesaw.edu/news/stories/kennesaw-state-officials-take-part-americas-competitiveness-forum says that CIFAL Atlanta is now headquartered at Kennesaw State and is a “public-private partnership between UNITAR and the City of Atlanta.” Lesser, by the way, used to be in charge of state economic development for the previous Governor. The one so deeply involved in creating and advocating for the Common Core. That would be Uncle Karl’s “From each according to his abilities, to each according to his needs” vision that is also the crucial component of the sustainable development vision above. The one that relied on capitalism producing a necessary level of technology that ICT–Interactive Communications Technology (computers and cable and satellite communication that allows instantaneous sound and visual communication) is viewed as fulfilling. Remember my “Peeking into the Behavioral Programming Blueprints” post from December 14 where I wrote about Marshall McLuhan? He had another book that came out after his death called The Global Village: Transformations in World Life and Media in the 21st Century that described that that instantaneous sound and visual communication would create a different kind of mind than print. A Post-Literate, Right Brained Person who would be more amenable to propaganda and the pressures of the group. I describe the role of IBM’s PTech initiative and its System of Systems global vision in my book, but the operating system of that IBM computer is what created the Microsoft fortune that funds all of the Gates funding of all these education initiatives tied to the Common Core. Axel LeBlois’ bio says he was President of Honeywell Information Systems. He also founded the Wireless Internet Institute. All the education initiatives the Gates Foundation is funding and all the education reforms being mandated by the education organizations Phil Jacobs is listed as being involved with have the effect of minimizing the Left-Hemisphere Man created by logic and phonetic print and heightening the “right-hemisphere man” that Marshall McLuhan wrote about and wanted so badly. Fascinating, huh? And precisely how the Gramscian March Through the Institutions of the West was supposed to work. None of the people involved in all this public sector advocacy even has to know all the elements I have just laid out. They can have the best personal intentions for these shifts and reforms. These laid out pieces though work like gears and are engaging us all in a clear vision that may well not be familiar to any of those actually imposing all of this on us. It is past time for everyone to know what the assembled gear plan looks like before it moves us over a fiscal, social, and economic cliff.